– In 2017, all major asset classes experienced strong returns. Many asset classes went from expensive to even more expensive over the course of the year, and strong momentum remains for many asset classes, even though it appears to have begun slowing down a bit. 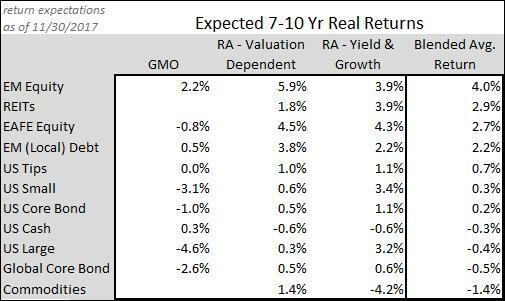 – Over the coming years, portfolio returns are expected to be muted due to the high current valuations. – During this difficult investment environment, one of the best ways to add value is to tilt investor portfolios in favor of asset classes with the greatest opportunity set (i.e. emerging market & developed international equities). Similarly, look to use relative valuation indicators to reduce portfolio risk from asset classes that have the lowest expected returns and are most likely to experience the harshest pullbacks (i.e. US large cap equities). 2017 was another great year to be invested in practically any asset class…though many value investors may not have guessed that to be the case at the start of the year. Domestic equities started 2017 as mildly expensive with a Shiller Cyclically Adjusted PE (CAPE) ratio at 27, much higher than the long-term median of 16, indicating that they probably weren’t the best opportunity when considering various asset classes; however, domestic equities payed no attention to their already high valuations and plowed forward to experience more than 22% returns over the course of the year. This resulted in expanding valuation ratios, with the S&P 500 ending the year with a CAPE ratio at nearly 33. The other major asset classes also experienced positive returns and positive momentum across the board. Based on the amount of green in the following table, in addition to the fact that 2017 was marked by unprecedented levels of low market volatility, it’s pretty clear to see why most investors found 2017 to be an enjoyable ride. Although domestic equities did experience strong performance after starting at expensive valuation levels, this is no reason to invalidate relying on the CAPE ratio as one of the most predictive indicators of future expected returns. On the contrary, investors were rewarded handsomely if they relied on the relative valuations between asset classes at the beginning of the year in order to pick the best investment opportunities. 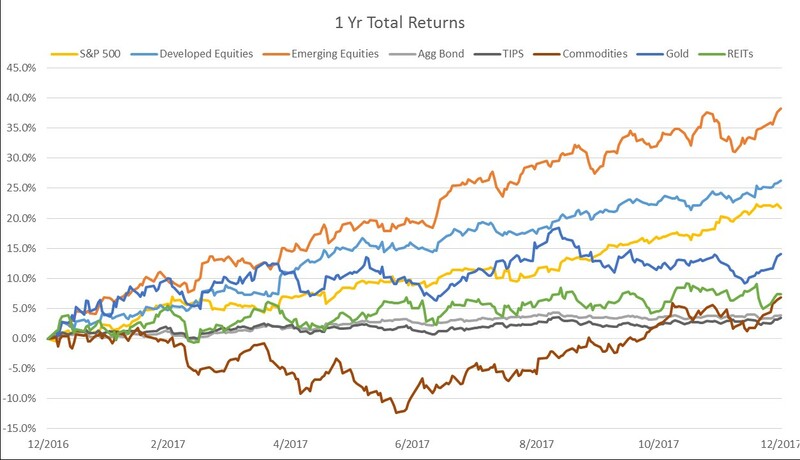 For instance, emerging markets and developed international equities were expected to have the highest future returns as of the beginning of 2017, and that theme really played out well over the course of the year with emerging stocks delivering nearly 38% returns. 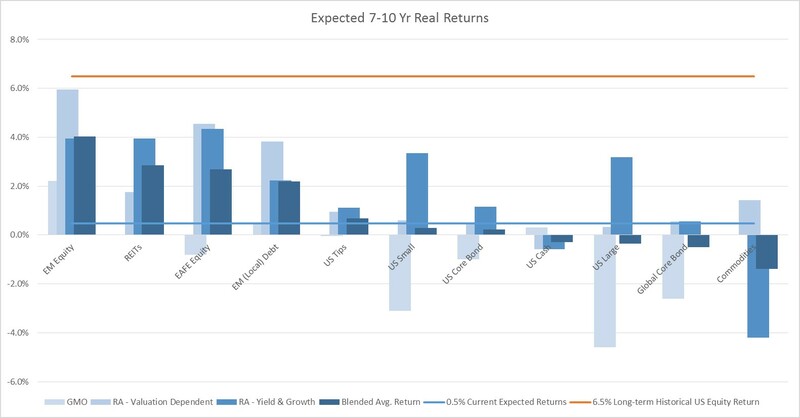 The long-term return forecasts are expected to play-out over full market cycles of 7-10 years, so the fact that domestic equities became more expensive this year simply means that investors should unfortunately expect even lower returns from stocks in the coming years. No one knows whether markets will experience either a sharp decline or a few years of flat performance to let earnings catch up, but it is clear that if you buy into the S&P 500 now with the CAPE ratio in the 97% percentile based on the historical distribution of CAPE values, there is little room for the S&P 500 to become more expensive from here. Naturally, many of the other asset classes became more expensive as well during 2017, but emerging & international developed equities still remain relatively attractive compared to the rest of the bunch. Looking forward to 2018 and beyond, it’s unclear whether the currently strong positive momentum will be able to continue much longer or whether the technical indicators will shift more in line with the fundamentals. Regardless of when or how the shift occurs, it’s critical that you keep in mind these low expected returns from a financial planning perspective, to ensure that you’re still able to achieve your unique goals despite a low return environment. Considering the relative returns is much more useful when determining an optimal asset mix within your investment portfolio. For instance, noticing that US equities are significantly overvalued and pose a serious potential risk within your portfolio – expected to barely beat inflation at best, or possibly some significant drawdowns in the near-term at worst – it would probably be prudent to shift a portion of your allocation that would normally be in US equities into other asset classes that may have less risk of poor performance in the coming years. Also, even if you don’t change your target allocation much or at all, it probably makes sense to rebalance your portfolio to target to reduce positions that have experienced outsized growth recently and represent a larger than intended portion of the portfolio’s risk profile. Just remember that following a repeatable process for making allocation decisions is key here, so that you can use the relevant data in meaningful ways to reduce risk in your portfolio over the long-term.